It has been too long since I have posted an update to my Top 5 Pens list, and honestly, I am not sure what has taken me so long. I think part of it is that I have gone through such a huge turnover in the types of pens I use on a daily basis (I’m looking at you fountain pens!) and wanted to be sure any new favorite gets a nice, long usage period. There is no doubt that this list marks a big change for me. For those of you who are new to this list let me explain what it is and what it isn’t. This list represents a current snapshot of the pens I am enjoying and using the most, not what I think are the best pens of all-time. It is also not a list of pens that I think are the best for you and your writing needs. Everyone has individual requirements and this group is currently suiting my requirements very well. Was there any real question? If I am going to spend this much on a pen I am certainly going to be using it a ton. It took me a year of reading and researching to finally pull the trigger on this pen and it was worth it. I use this pen every day at work and it has lived up to all expectations. My initial reaction to this pen was shock and amazement at how much I liked it and those feelings haven’t changed. I liked it so much that I now also have the Metal Roller and the recently introduced Click Roller. Are these pens overpriced for what they are? Absolutely. But the gel ink cartridge is one of the best I have used and that is what makes this pen work for me. A long-time favorite, and I don’t see that changing anytime soon. I keep one at work, one in my backpack, one at my desk at home, and a few more stashed away in the closet as backup. If you like ultra-fine gel ink lines and can put up with a small amount of finickiness you should try one too. 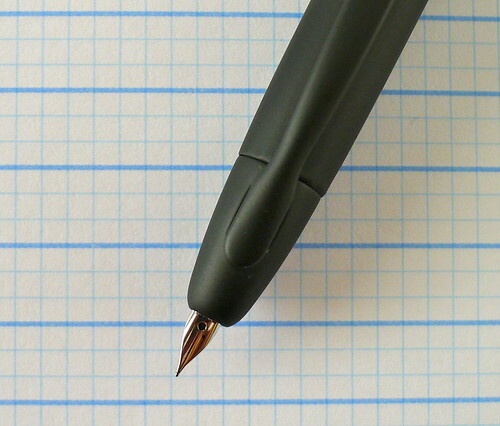 Like the Pilot Hi-Tec-C above, the Sakura Pigma Micron has been, and will always be, a favorite of mine. The plastic tip provides a nice change of pace from my various metal-tipped pens, and the archival ink properties certainly come in handy. I have worn the lettering off the barrel on more than one of these. This has been a go-to pen of mine for a while. Now that I have discovered the greatness of the Kaweco EF nib and how easy it is to change out the nib I am using it more than ever. Between this pen and the Vanishing Point I am having a tough time giving other fountain pens a fair shake. Posted on June 14, 2012 by Brad Dowdy and filed under Top 5.